Barbara Walker (b. 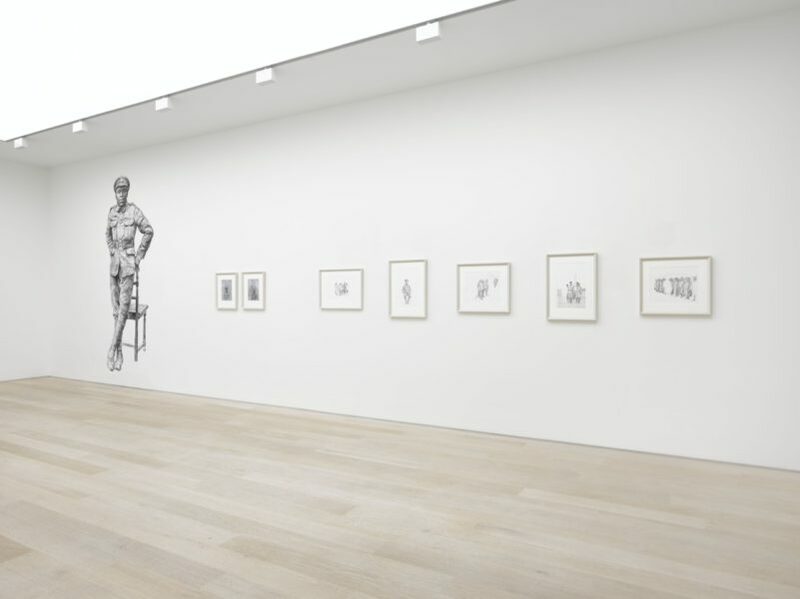 1964, Birmingham, UK) is a figurative artist who works in a range of media and formats, from small embossed works on paper to paintings on canvas and large-scale charcoal wall drawings. Through her practice, Walker proposes alternative narratives that expose and undermine cultural assumptions, often depicting people who may be categorised or classified as minorities by society. In 2017 Walker was included in the Diaspora Pavilion at the 57th Venice Biennale. The Pavilion was conceived as a challenge to the prevalence of national pavilions within the structure of an international biennale. 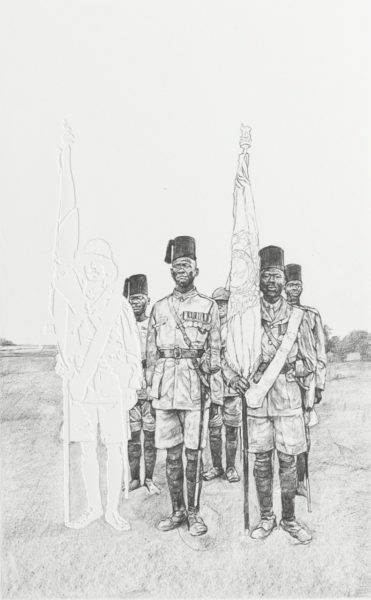 Walker was shown alongside 19 other British-based artists whose work explored the infinite complexities of the idea of nationality and living in the diaspora. 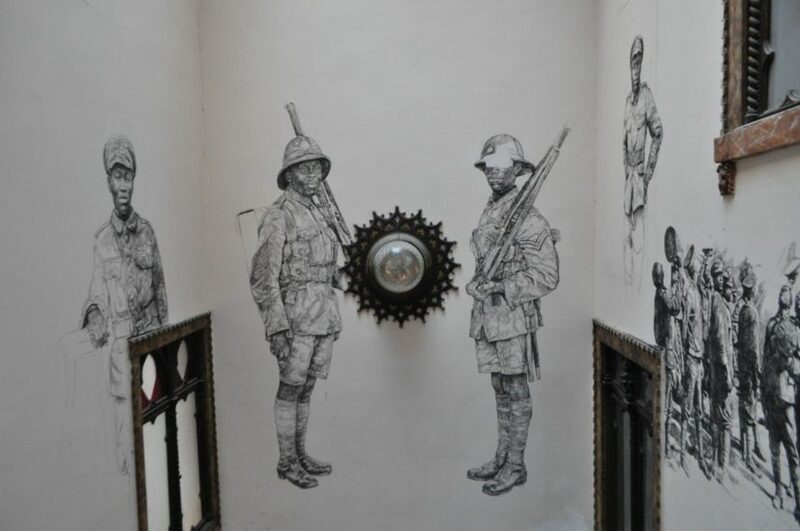 On the walls of the Pavilion’s staircase, Walker showcased Transcended (2017) – large-scale charcoal drawings based on photographs of soldiers from the British West India Regiment during World War I. 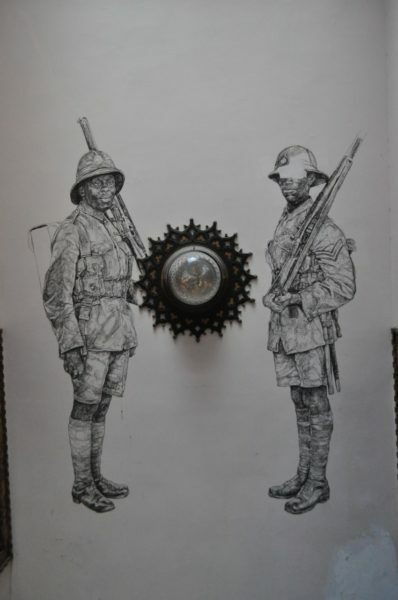 Denied the right to fight as equals alongside white soldiers, these men were side-lined to the periphery of the War and tasked with a menial supporting role. 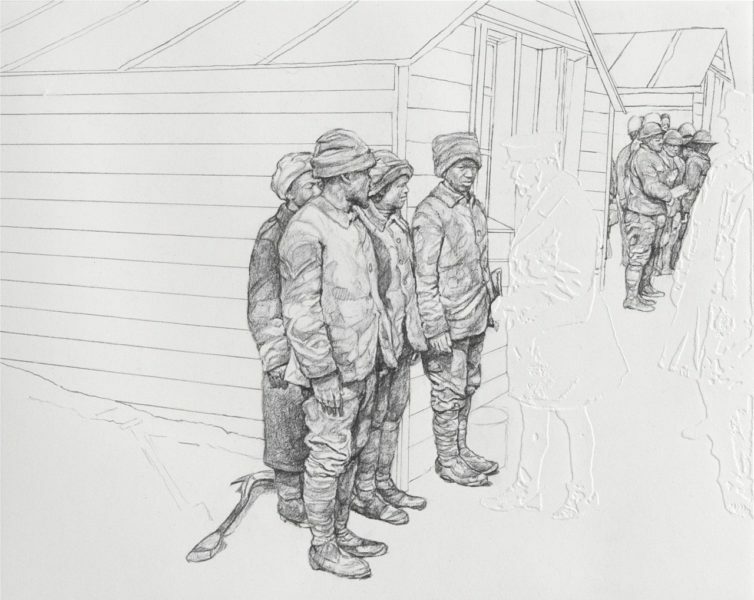 Through her work, Walker unearths hidden histories and celebrates the contribution of these soldiers. 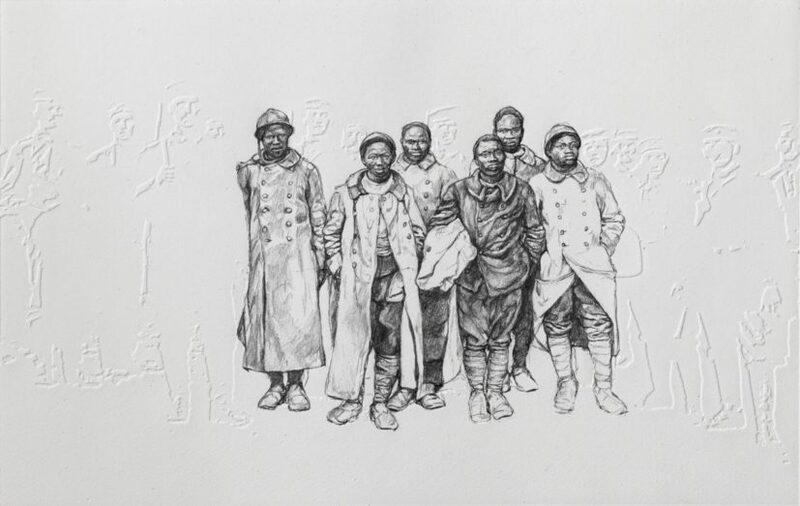 Her works currently on show at Alan Cristea Gallery further highlight this forgotten history of black servicemen and continue to explore issues of visibility and representation. Working from public photographic archives, Walker creates poignant and affecting portraits that transfer visibility back to the subject, offering an alternative and balanced interpretation of a nation’s history. 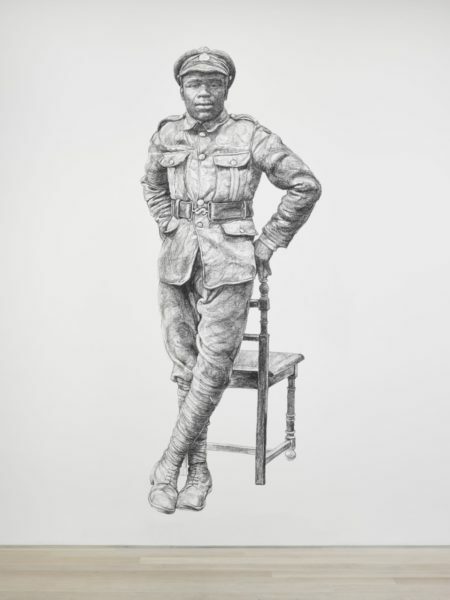 Upon entering the gallery, one is immediately confronted by the gaze of a black soldier casually leaning against a chair. This large-scale charcoal wall drawing took a week to complete and will be washed from the Gallery wall by the artist at the end of the exhibition; referencing the erasing from history of certain communities. The act will not be public, but it will be recorded. Alongside this piece are five smaller framed works from her ongoing series Shock and Awe (2015-present). 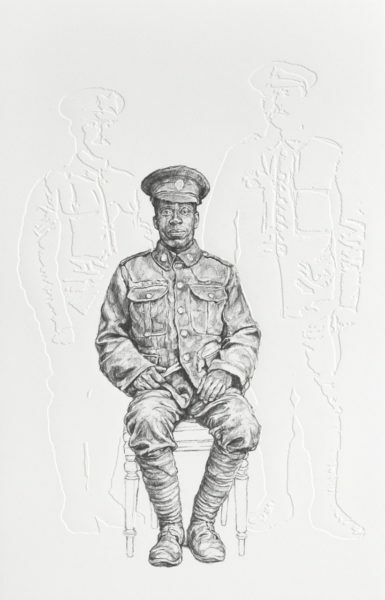 In these works, white soldiers are rendered invisible through considered embossing whilst black soldiers are intricately portrayed through delicate graphite marks. Inverting the anonymising act, these portraits reclaim an equal and independent position of the former ‘other’, establishing their own narratives as opposed to the ones put forward by the former oppressor. Throughout her practice, Walker addresses a necessary re-writing of history, or at least an alternative take on history. Her removal of detail – through erasing, tearing away, cutting out, embossing, blotting, whitewashing – emphasises a compelling absence of representation in society. After being in the presence of her portraits, one comes away with the profound sense of identity being constantly under construction and the overwhelming need for history to be continuously checked, corrected and restructured. 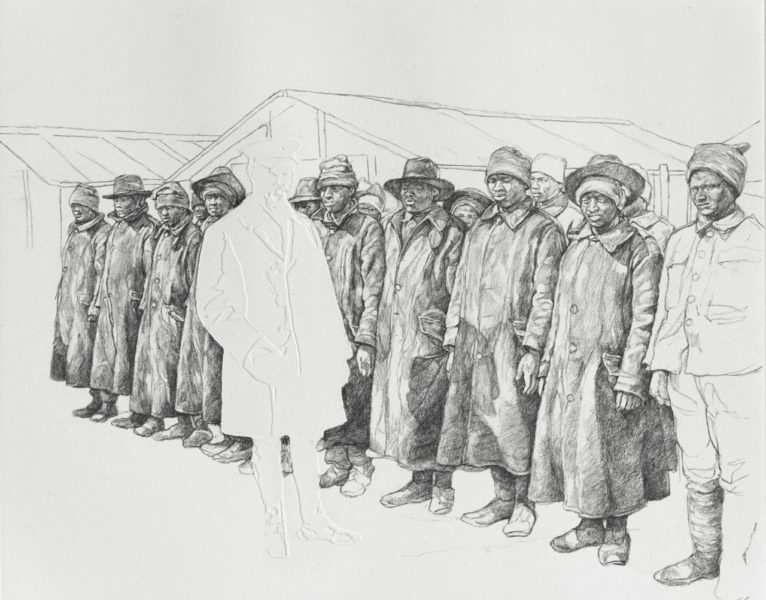 Next month, Barbara Walker will embark on a yearlong residency at Turner Contemporary in Margate. She will create new work exploring migration and the movement of people, with a focus on the women at the heart of Margate’s migrant communities.